Corn farmer Pedro Galicia was girding for a fight earlier this month as he marched down Mexico City's Paseo la Reforma to the U.S. Embassy, clutching a rusty machete in his calloused right hand. 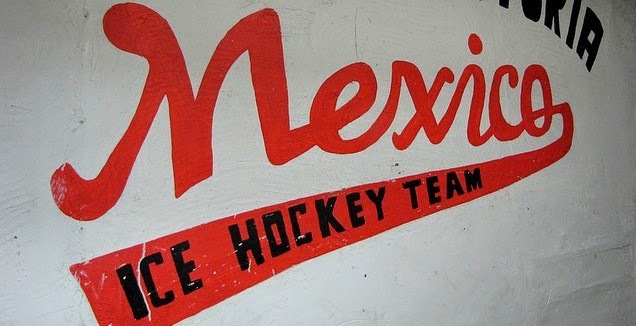 The native of San Salvador Atenco, State of Mexico, has a history of struggling against long odds. He participated in a 2002 uprising of machete-wielding campesinos that derailed plans for a new Mexico City airport, which was scheduled to be built on his ejido, or communal farm. He also scrapped with local and state police in May 2006 after vendors were removed by force from a San Salvador Atenco flower market. Galacia and his ejido members regularly wade into conflicts around the region, waving their machetes at demonstrations as a show of solidarity. Now he's vowing to fight the 14-year-old NAFTA agreement that mandated the lifting of agricultural import tariffs on Jan. 1. Galicia, a short man with thick stubble, proudly pointed his machete skyward has he expressed concern that a flood of duty-free corn and beans from highly subsidized U.S. producers would wipe out his livelihood and eventually drive members of his ejido from their land. "[The opening] puts us at a disadvantage against our rivals," he said. "We want to be able to eat … to live with dignity." Galicia is just one of millions of campesinos facing an uncertain future as duty-free imports of white corn, beans, sugar cane and powdered milk started flowing duty-free into Mexico on New Year's Day. The opening has provoked concerns that some of the country's poorest and most marginalized residents will be forced to abandon the countryside, unable to compete against better equipped and more highly subsidized competitors looking to claim market share south of the border. Nationwide protests have flared since Jan. 1. The nation's largest farm group, the National Campesino Confederation, or CNC, also promised a day of action on Jan. 31, saying the new NAFTA measures would adversely affect 1.4 million campesinos in 2008. But if everyone knew it was coming, why was no one ready? Mexican producers have had 14 years to get ready for the arrival of foreign competition, but many corn and bean producers still seem unprepared for open markets - even though the federal government has been increasing its funding for agriculture support programs. "It ended up being a mixed blessing to have 14 years [to prepare]," said Alberto Díaz-Cayeros, political science professor at Stanford University in Palo Alto, Calif.
"It turned out to be too long. If the timeline had been five years ... I think it would have been very clear to many of the producers that this was [more urgent]." The angst over NAFTA's impact on the rural economy has spurred opposition politicians into action. Former presidential candidate Andrés Manuel López Obrador made the reworking of NAFTA an integral part of his 2006 president campaign. And the Permanent Commission of Congress passed a non-binding resolution on Jan. 4 urging President Felipe Calderón to revisit the parts of NAFTA governing agricultural issues. But opening NAFTA, while possible, would put everything on the table – including the manufacturing sector and labor standards – said Sidney Weintraub, a trade expert at the Center for Strategic and International Studies in Washington. "If they were to renegotiate agriculture they'd have to renegotiate everything," he explained. He added that any NAFTA partner could, in theory, opt out or ask to rework sections of the agreement, but he said that wasn't likely to happen. "You don't sign free trade agreements to renegotiate them every five years," he said. The federal government appears unwilling to propose NAFTA revisions. Arturo Sarukhán, Mexico's ambassador in Washington, recently cautioned against reopening NAFTA, saying that doing so could "open a Pandora's Box." Calderón also publicly dismissed calls for reworking NAFTA, telling a gathering of the country's diplomatic core: "The countries in the region now buy five times more from Mexican producers than they did in 1994." Analysts agree with the president. "In terms of agriculture, things have actually gone pretty decently under NAFTA," said Federico Estévez, a political science professor at ITAM. "[Farmers] haven't adjusted fully ... but it's clear that productivity has risen - even production itself has risen in certain key areas." Mexico now produces more corn than when NAFTA was implemented in 1994, with production jumping from 18 million tons to 33 million tons in 2007, according to the Agriculture Ministry, or Sagarpa. Productivity also improved, with corn yields going from the less than two tons per hectare 14 years ago to 2.9 tons last year. Corn and beans were among the final products left protected by NAFTA, however. (Tariffs on other crops were slashed at earlier dates.) Agriculture Secretary Alberto Cárdenas Jimémez pointed to the removal tariffs on 40 agricultural items in 2003 as evidence that the forecasts of misery in the countryside were unfounded. "They said there was going to be chaos and that death would come to the countryside, but what happened with the majority of those  crops is that production and productivity increased over a period of three to four years," he said in early January. The CNC, an organization founded in 1938 that has long been closely affiliated with the Institutional Revolutionary Party, PRI, disagreed with the favorable assessments of NAFTA, which it blamed for displacing five million campesinos. CNC spokesman Guillermo Correa accused successive federal governments of forgetting the countryside over the past 20 years and pursuing policies that would see "campesinos disappear." The ejiditarios became dependent on government institutions for providing fertilizer, supplies and credit – often though corrupt and inefficient institutions – and sold their products to Conasupo, a government buyer. 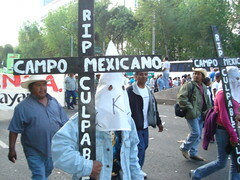 Come election time, organizations like the CNC would marshal campesino support behind the PRI. Correa blamed many of the current problems in the countryside on a lack of infrastructure, the dismantling of Conasupo in the 1990s and the closing of agencies selling basic agriculture supplies. Estévez, the ITAM political science professor, said that much of the money previously mandated for farm programs was gobbled up by middlemen and vast bureaucracies, leaving producers with only a trickle of funds. He also described much of the current CNC maneuvering and some campesino behavior as a throwback to the long period of PRI rule. "You still have a mass of people tied to the soil in the countryside that are relatively unproductive ... and they're waiting for handouts," he said. "That's all they've ever gotten; of course they're wanting more." The federal government will spend 20 billion pesos on agriculture in 2008 with much of the money going to farmers through the Procampo program, which pays stipends directly to those who work the land – often around election time, according to Estévez. The Procampo program was also introduced during the Salinas administration. The program was expanded under President Vincente Fox – a move that Estevez says helped boost the National Action Party's rural vote in 2006. Iberoamericana political science professor Aldo Munoz noted that large producers in northern and western Mexico collect most of the Procampo money, but he added that the modest amount paid to small producers "deactivates protests" in the countryside. Galicia, the machete-wielding farmer, begged to differ. At the protest, he spoke of the unrest springing from increased competition ushered in by NAFTA and the continued neglect of the countryside. "The government is creating the conditions for rebellion," he said.